We’d like to bring to you today a piece of news that was published before this blog existed, but which we think is extraordinarily interesting. We were reminded of it by Basques in Mexico, a mailing list of a group of diaspora Basques whose activity is really worthy of recognition. 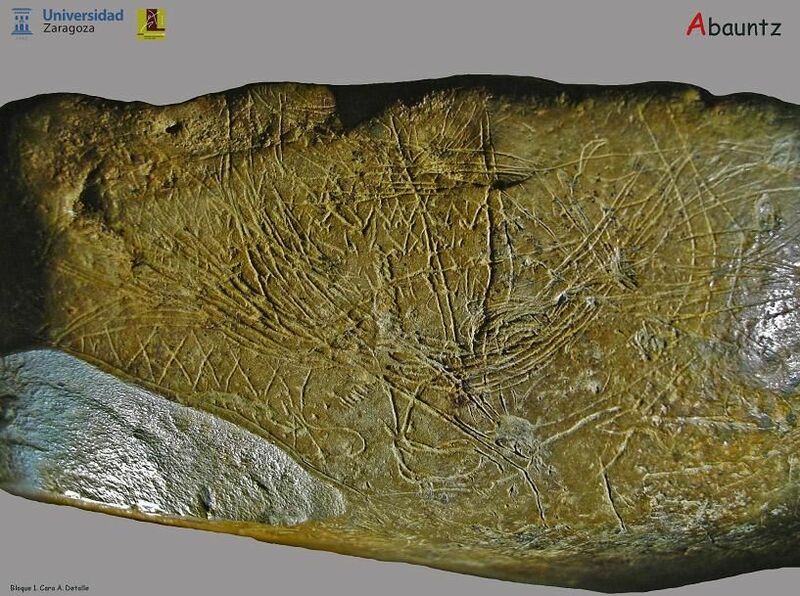 This news is about research published in 2009 in the Journal of Human Evolution (which we’ve cited on other occasions) and headed by a group of researchers at the University of Zaragoza, which analyzed some rocks with paleolithic etchings dated to around 13,660 years ago, in the Abauntz cave in Navarre. This is, accourding to the researchers, a map of the area around the cave, where geographical features like rivers, refuges, or mountains are, as well as paths and trails. Those hunter-gatherers drew, over 13,000 years ago, on that rock animals, people, and a map which turns this artifact into one of the most important in European prehistory. But, who were these people? Abauntz cave is found to the north of Pamplona, near the town of Arraiz-Orkin at the entrance to Baztán valley. This location, so close to this valley, is of fundamental importance to help us understand who made this prehistoric map. As we said in an earlier entry which has become the most visited one on this blog: The Basques, a people with more than 15,000 years of history, which colonized Europe. In that entry, we talked about how genetic research at the University of the Basque Country performed on inhabitants of that valley from 15,000 years ago and today showed that they were directly connected. In other words, the Basques living in the Baztán today are the direct descendents of those who lived there 15,000 years ago. Undoubtedly, those who etched that map more than 130 centuries ago wree part of the same ethno-genetic group, which means that they were the direct ancestors of today’s Basque. We’ll finish off with a reference to the Journal of Human Evolution, a news article that appeared in Peru in those days, and an interesting post from the blog “Navarrese Archeology”.